Home > Pet Services > Pet Shows: What Jobs Are Available? Agricultural associations are among the many hosts of the much-loved UK pet shows held throughout the year. Summer fetes and country fairs also attract thousands of pet owners. So, if you’re looking for seasonal work, find out what’s happening in your area first! If you have knowledge and experience of specific species, or can turn your hand to a variety of physical tasks, you may be just what the show organizers are looking for. Panels of judges, ring stewards, commentators and course-builders are just a few of the experts needed; but every successful pet show is run by a strong team of hard-working and versatile people who are happy to muck in where needed! 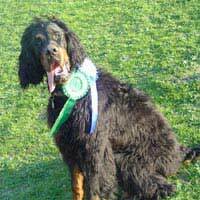 There is a considerable amount of work undertaken in the preparation of pet shows that starts months and weeks in advance of the actual show day. As soon as you know about a planned event in your area, make contact with the organizers and offer your services! It doesn’t matter if you have no previous experience-most pet show organizers are happy to take on new helpers. There are numerous specialist regional shows for farm livestock, horses, goats, dogs, cats, rabbits and other small mammals, fish, reptiles and exotics, caged birds, poultry and so on; any of these are good places to find work, even if you know little about the animals. Personal physical fitness and a willingness to learn count for a lot! Cars, lorries, horseboxes and trailers: they all need to be efficiently parked at events! Car parking attendants are among the unsung heroes of shows and show organizers are often desperate for help in these areas. Builders and labourers have their work cut out long before the first pet arrives. Otherwise, how would entrants keep their prized pets safe and separate from other animals? (If you’ve ever seen Crufts on TV you’ll have noticed the rows of purpose-built dog cages, show rings, trade stands and so on.) All these facilities have to be constructed in advance! Refreshments, for animals and people alike, are a huge part of any show. Find out who has the franchise at a show near you and contact them direct. Likewise, trade stands make up a large part of the business side of things at pet shows: find out which local companies will be attending and contact them in advance to see if they need an extra pair of hands. Animal charity stalls are frequent attendees at pet shows: why not offer your services for a couple of hours? On a more serious note, judges of pet shows may be internationally renowned experts, whose reputation, skill and judgement has taken years to achieve. Ring stewards, show secretaries, results compilers, course-builders, photographers and other officials are chosen to do specific jobs for obvious reasons; but there can never be too many gofers! On a personal level, I have judged at big shows, organized equestrian events and helped out with maggot racing: I still can’t decide which was my favourite show job! If you are serious about finding work at a pet show and don’t mind where you start there are plenty of opportunities; as long as you don’t take yourself too seriously and can keep your sense of the ridiculous intact!